CVP 701 88-key GH3X (Graded Hammer 3 with escapement) keyboard, 4.3 inch (480 x 272 dots) TFT colour LCD display, Yamaha CFX & Bosendorfer Imperial concert grand piano sounds, Virtual Resonance Modelling (VRM), 256-note polyphony,777 Voices + 29 Drum/SFX Kits +480 XG Voices, 310 Styles (253 Pro Styles, 21 Session Styles, 36 Pianist Styles), Piano Room with Session Mode, Microphone input, compatible with Chord Tracker app. CVP709 88-key NWX (Natural Wood X with escapement) keyboard with Synthetic Ivory key tops, linear graded hammers and counterweights, 8.5inch (800 x 480 dots) TFT LCD colour touch screen, Yamaha CFX & Bosendorfer Imperial concert grand piano sounds, Virtual Resonance Modelling (VRM), 256-note polyphony, GP Response Damper Pedal, 1,270 Voices + 37 Drum/SFX Kits + 480 XG Voices, 600 Styles (30 Audio Styles, 473 Pro Styles, 52 Session Styles, 9 Free Play Styles, 36 Pianist Styles), Piano Room with Session Mode, Music Finder (2,500 records), USB Audio Recorder (Playback: MP3, WAV / Recording: MP3, WAV), (30W + 30W + 20W) x 2 + 40W amplifier, (16cm + 5cm + 3cm (dome)) x 2 + 20cm speaker system, Vocal Harmony 2, Intelligent Acoustic Control (IAC), Acoustic Optimiser. Connect an iPhone, iPad or iPod touch with an optional UD-WL01 USB WiFi adapter or i-UX1 MIDI interface. OPTION 2: Mini Grand - Cabinet Style - Polished Ebony or Polished white. 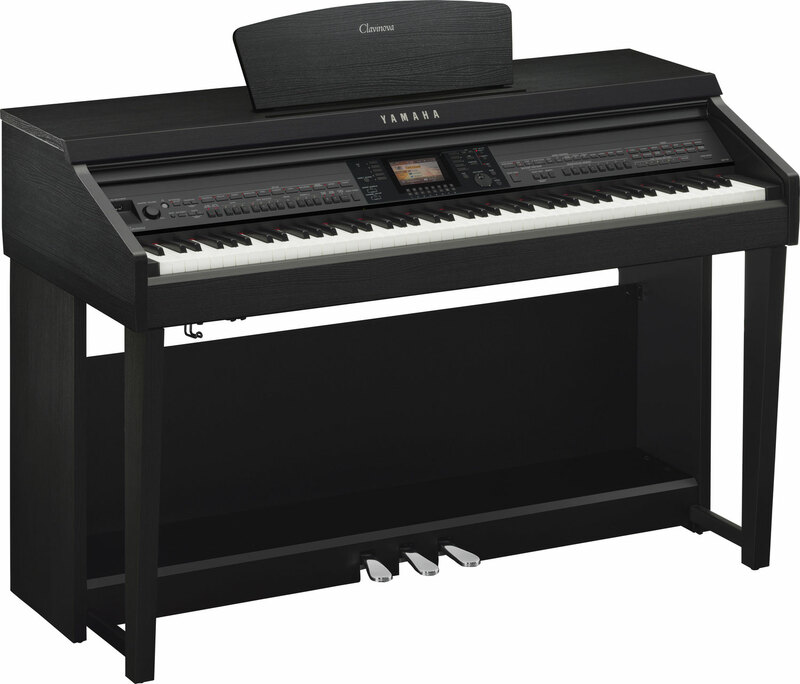 CVP 705 88-key NWX (Natural Wood X with escapement) keyboard with synthetic ivory key tops, 7 inch (800 x 480 dots) LCD colour touch screen, Yamaha CFX & Bosendorfer Imperial concert grand piano sounds, Virtual Resonance Modelling (VRM), 256-note polyphony, 984 Voices + 33 Drum/SFX Kits + 480 XG Voices, 470 Accompaniment Styles (396 Pro Styles, 34 Session Styles, 4 Free Play Styles, 36 Pianist Styles), Piano Room with Session Mode.